Wouldn't you shiver for some finish-line hot chocolate? I don't like fall as the season--the leaves changing, the cooler weather, the shorter daylight hours just aren't my thing--but I do like fall for running. Especially when the running happens after the Chicago Marathon. The Lakefront Path is practically deserted, you can run almost any time of day without roasting or freezing, and there are still plenty of races to run on the weekends. Perfect if you're ready for a late-season PR before shutting it down for the year, looking to run your first 5K (this is aimed specifically at my friend who wants to run a 5K but has put it off time and again), or just have fun at the races (the costume-wearing crowd). I'm not even a week out from running the marathon--and thought I'd be putting away my running shoes for a few weeks, or months--but I can't help but want to race again. Not a marathon--two in 28 days was plenty for my legs--but anything shorter will do. Men’s Health Urbanathlon, October 13. Race registration is about to close (or has closed?) for this 10.8-mile event that's not your usual running race. With a name like Urbanathlon, expect to see obstacles and challenges where you’ll test your strength and not just your speed. Rumor has it that there's a stair climb inside Soldier Field. And if Chicago doesn't work, there are still Urbanathlons to be had in New York (Oct. 27) and San Francisco (Nov. 18). Frank Lloyd Wright Races, October 21. I’ve run this race off and on over the years, usually choosing to run the 10K over the 5K—I think in hopes that I’ll get to spot more Frank Lloyd Wright architecture as we cover more of Oak Park. I’m concentrating too much on running fast—I’ve PR’d here twice—to notice the houses, but I do remember loving the finish line food. Monster Dash Half Marathon and 5K, October 20 (make that October 21, apparently I looked at the website too quickly the first time around). If you’re not ready for 13.1, there’s a 5K option (and also a 10K though it's not mentioned in the race title). All give you the excuse to run in costume--and trick or treat at the aid stations. Pumpkins in the Park, October 27. This race sounds even better than it did before, even with the date change. It’s still in the afternoon and it still has the costume contests, but now racers can stick around the finish line to watch a ghoulish movie (this year it’s Ghostbusters). 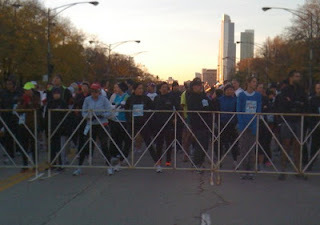 O’Hare 5K, October 20. New this year and limited to only 2,000 runners, you apparently get to run on one of the airport runways. This could be a one-shot deal (like the race a few years back that gave participants free reign of I-355 before it opened to car traffic) that we’d all wish we did when it’s not around again. Hot Chocolate 15K/5K, November 4. Chocolate fountains and fondue come to Chicago on Nov. 4—and other cities throughout the year. Last year’s site change to Grant Park made me really enjoy this race so much so that I forgot about the awfulness that was packet pick-up chaos at Union Station. And you can really earn your chocolate this year: the 5K is already sold out so you have to run the 15K if you register now. Perfect 10, November 10. I almost forgot about this race, maybe because I saw some disgruntled tweets about its inaugural running last year. But when I saw that it was back, I learned that you had your choice of running a 10K or 10 miles. And even if it’s still wonky, it’s tough to really care when we’re running on the familiar Lakefront and your route diverts from the usual one we’re used to covering. What races do you want to run this fall?